Everyone knows Smokey Bear, Woodsy Owl, and maybe even Ranger Rick Raccoon, but there are many other forest and forestry-related fictional characters that long ago fell by the wayside. Peeling Back the Bark‘s series on “Forgotten Characters from Forest History” continues with Part 17, in which we examine Turp and Tine. The annals of classic cartoon duos are packed with famous forest-dwelling characters who worked together such as Rocky and Bullwinkle, Chip ‘n’ Dale, Yogi and Boo Boo, and many others. Venture deep enough into the recesses of cartoon history and you’ll also find the classic forgotten forest history character duo of Turp and Tine. Who were these simple painters who transformed an industry? Well the story of Turp and Tine has its beginnings over a century ago with the Hercules Powder Company. A division of DuPont, Hercules became an independent company in 1912 after a federal court ordered DuPont broken up for violating the Sherman Anti-Trust Act. As an independent, Hercules continued its growth in the explosives market, supplying construction firms and the military with gunpowder, dynamite, and blasting powder. As of 1919, 99% of the company’s revenue came from sales of these various explosives. Looking for diversification and new opportunities, the company expanded in 1920 into the world of naval stores (products derived from pine tree sap). Hercules bought the rights to pull pine stumps on large expanses of cut-over lands throughout the South, while also investing in research and technology to develop products from wood rosin. Soon the company was manufacturing steam-distilled wood turpentine from these stumps on a massive scale. This was contrary to the prevailing gum turpentine cut from living pine trees, which dominated the market at this time. With Turp and Tine leading the way the Hercules Company continued to grow throughout the 1920s and 1930s. At the time of America’s entrance into World War II, Hercules was the country’s largest producer of naval stores. Turp and Tine would ultimately fade into oblivion, though, as the naval stores industry declined and Hercules expanded into production of other chemicals as well as aerospace equipment and fuels. But like all forgotten forest history characters they continue to live on here at FHS. *Klein, Julius “What Are Motion Pictures Doing for Industry?” The Annals of the American Academy of Political and Social Science 128 (November 1926): 79-83. Turp and Tine show how Hercules steam-distilled wood turpentine is produced (click to enlarge). Turp and Tine show how Hercules turpentine is distilled from pine wood chips (click to enlarge). Everyone knows Smokey Bear, Woodsy Owl, and maybe even Ranger Rick Raccoon, but there are many other forest and forestry-related fictional characters that long ago fell by the wayside. Peeling Back the Bark‘s series on “Forgotten Characters from Forest History” continues with Part 15, in which we examine Joe Beaver. 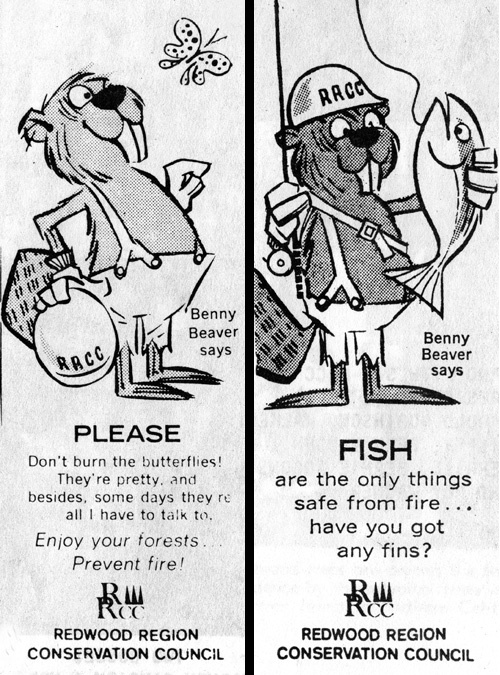 Before there was a Smokey Bear or a Woodsy Owl, the U.S. Forest Service had another animal preaching the messages of forest conservation and fire prevention: Joe Beaver. Joe (an actual beaver, not the 8-time world champion cowboy) was the creation of legendary cartoonist Ed Nofziger, who worked for the Forest Service during World War II before moving on to the large animation studios of his day. The story of Joe Beaver’s creation is intertwined with Nofziger’s divergent career path into the world of forestry. Ed Nofziger was born in 1913 and raised in California, graduating with an art degree from UCLA in 1936. His work as a cartoonist soon took him to New York, where he became a regular contributor to the Saturday Evening Post and other publications. The outbreak of World War II altered his career path, though, bringing him renown he might otherwise have never attained. As a member of the pacifist Church of the Brethren, Nofziger was a conscientious objector during the war. When conscripted in 1943 he was assigned to the Forest Service as an alternative to military duty. Nofziger was first sent to a Forest Service station in Cooperstown, New York. Despite having no previous forestry experience (other than being the son of a West Coast lumberman), he took to the work and soon put his own unique skills to good use. Nofziger came up with the idea for Joe Beaver as a way to combine humor with a message of forest conservation. The Joe Beaver cartoon first appeared in The Otsego Forest Cooperator, a publication of the Otsego Forest Products Cooperative Association in Cooperstown. The character was successfully received, and the Forest Service decided to promote the cartoon on a national level. In 1945 Nofziger was transferred to the USFS office in Philadelphia as Joe Beaver’s audience continued to grow. 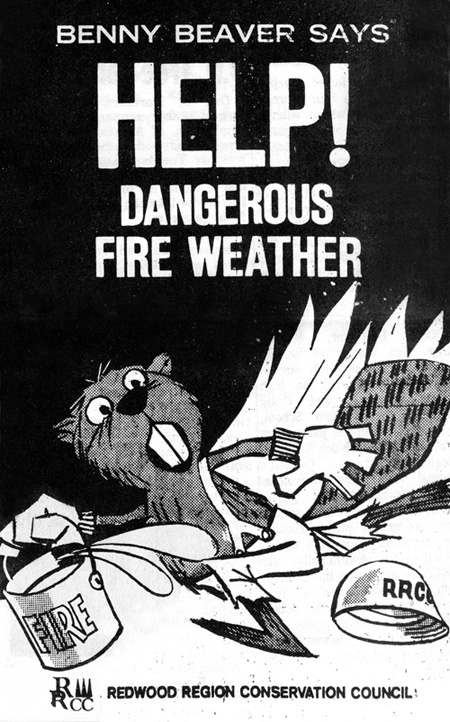 The Forest Service distributed the comic to lumber and trade journals and other publications throughout the country. Besides speaking, though, Joe Beaver didn’t take on other human characteristics like similar animal characters. Joe never wore clothes or a hard hat, for example (a la Benny Beaver and others). He was presented as a regular beaver living in the forest, dedicated to spreading the message of conservation. While with the Forest Service, Nofziger also completed the short book Two Trees, created from hand-carved linoleum prints. This story of two trees named Ashton and Elmer provided a message to children of the importance of proper forest management. Everyone knows Smokey Bear, Woodsy Owl, and maybe even Ranger Rick Raccoon, but there are many other forest and forestry-related fictional characters that long ago fell by the wayside. Peeling Back the Bark‘s series on “Forgotten Characters from Forest History” continues with Part 14, in which we examine Abel Woodman. As promised, the mysterious new character made his debut in the January 1948 issue. Found in a one-panel comic in the back of the magazine was a well-built man with beady eyes, smoking a pipe and holding a large axe. The man was dressed in traditional lumberjack garb (boots, suspenders, flannel shirt) and there was no doubt about his location—a large Crossett smokestack was visible in the background. First-ever appearance of the man who would become Abel Woodman, January 1948 (click to enlarge). The only problem was he had no name. To rectify this, the Forest Echoes editorial staff created a contest, inviting readers to submit their name ideas for the new character. As seen under the cartoon above, the best entry would win a $25 U.S. Savings Bond (side note: The “I ain’t Mr. Hush…” comment references a famed 1946 contest on the Truth or Consequences radio game show, where host Ralph Edwards phoned random people and asked them to identify a mystery voice known only as “Mr. Hush”). Click to view the full February 1948 Abel Woodman cartoon. Abel Woodman immediately became a regular monthly feature of the magazine. At the back of every issue readers would find Abel delivering a message on forest conservation, job safety, or some other local topic, always in his own humorous way. Like the Forest Echoes publication itself, the Abel Woodman cartoon was a reflection of life in Crossett and Crossett’s view of the world (in this case through the eyes of artist Lee Davis). Abel Woodman cartoons provided a unique commentary on issues specific to Crossett (a new town jail, Crossett High football, a redesigned company logo, the joys of Crossett bleached food board!) as well as more general concerns (taxes, the dangers of drinking and hunting, anxiety over the atomic bomb). Abel remained a permanent fixture on the inside back cover until the final issue of Forest Echoes in June 1962 (the year Georgia-Pacific purchased the Crossett Lumber Company). For this fourteen-year run, the Abel comic was drawn by artist Lee Davis. In his final year Davis found a way to put himself in the action alongside Abel. Davis did get help from the public along the way. In 1958 Forest Echoes held a “Cartoon Editor” contest, inviting the public to submit “a situation and appropriate remark for an Abel Woodman cartoon.” Ten winners won $10 each and had their cartoon ideas drawn by Davis and printed. The first winning entry (from Lloyd Gardner) was published in March 1958, and is notable in that it foresaw “Moon Trees” a good thirteen years ahead of Stuart Roosa’s journey into space. The final Abel Woodman cartoon ran in the last issue of Forest Echoes in June of 1962. His glory years seemingly already behind him, Abel had been reduced to company shill—touting the benefits of charcoal made by the Crossett Chemical Company. Despite this inauspicious end, Abel Woodman lives on in Crossett. In 2002 an “Abel Woodman” statue was erected in a small park in the middle of town. The original Abel Woodman also lives on here at FHS in our collection of Forest Echoes magazines, and our other materials documenting the history of the company town of Crossett, Arkansas. Everyone knows Smokey Bear, Woodsy Owl, and maybe even Ranger Rick Raccoon, but there are many other forest and forestry-related fictional characters that long ago fell by the wayside. Peeling Back the Bark‘s series on “Forgotten Characters from Forest History” continues with Part 13, in which we examine Herman I. Cautious and Paula Bunyan. The first week of May marks the annual occurrence of North American Occupational Safety and Health Week. Sponsored by the American Society of Safety Engineers (ASSE), the Canadian Society of Safety Engineering (CSSE), and the Occupational Safety and Health Administration (OSHA), NAOSH Week is intended to raise awareness about occupational safety, health and the environment. In honor of NAOSH week, and in the spirit of workplace safety, Peeling Back the Bark brings you not one, but two new forgotten characters of forest history. In early 1960, the Pacific Plywood Company of Dillard, Oregon, launched an innovative new safety program. Under the slogan “Caution Pays You,” the new program awarded employees for eliminating workplace accidents. Accident-free years would bring cash awards, based on money collected from monthly contributions into a Safety Dividend Account plan. To help launch this new safety program, a promotional character was introduced: Herman I. (Izzy) Cautious. While his name was a basic play on a safety question (“her man, is he cautious?”), there was no doubt about Herman’s commitment to workplace health. Always safely decked out in hardhat and gloves, Herman appeared on posters and signs around the plant to raise awareness for the program. His image was accompanied by the “Caution Pays You” slogan, which was trademarked in 1960. Pacific Plywood employees with Herman I. Cautious signs. Bob Young at far right. The idea to use monetary rewards to reduce accidents came from Pacific Plywood Company’s Safety Director Bob Young. He and others at the company had big plans for the program. An article in the May 1960 issue of The Lumberman stated, “Considerable interest has been shown in the plan by outside industries, and many inquiries have been made about its operation even before it has been started.” It’s unknown how much interest was shown in the Herman Cautious character, though. He was used on company safety awards for a short time, but then appeared to quickly vanish from the public eye. Herman Cautious wasn’t the only hardhat-wearing forest-related safety character to fade from view in the early 1960s. The U.S. Forest Service has a forgotten safety character of its own: Paula Bunyan. Paula, drawn by legendary Forest Service artist Rudy Wendelin, was presented as the “Guardian of Safety” for the agency.